You’ll laugh a lot, think a lot (but not too much) because all the wildly modern ideas expressed in George Bernard Shaw’s 1910 comedy “Misalliance” that were new then — equal rights for men and women, outrage over exploitation of the working classes, anger about the gap between rich and poor, exercise and healthy lifestyles — all are well established and accepted in 2015. Right? Full disclosure: George Bernard Shaw is one of my most favorite playwrights. He is amazing. Beginning as a journalist, he wrote more than 60 plays, plus essays, novels, short stories and criticism. He is as eminently quotable as Shakespeare. He was born in Dublin in 1856 and died in 1950 but comes off as totally 21st century. He’s the only person awarded both a Nobel Prize for Literature and an Academy Award (for Best Adapted Screenplay) for work on the film “Pygmalion” based on his play. 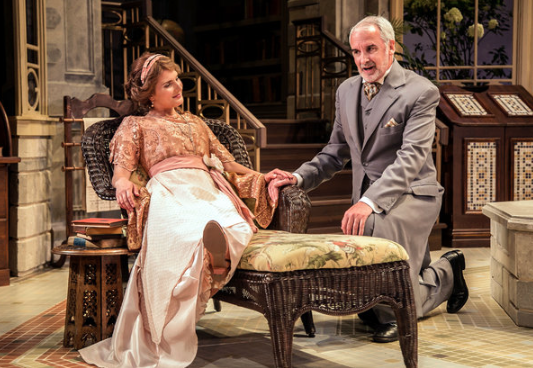 But we’re not talking about that play, which served as the basis of the money-making “My Fair Lady.” What interests us is the delightful production of “Misalliance” currently on stage at the Shakespeare Theatre of New Jersey in Madison through August 30, which also addresses “the New Woman” and good marriages. Set during a sunny afternoon in 1909 at the country home of John Tarleton, a very successful manufacturer of underwear ( a word, one assumes, not usually mentioned among mixed company then), the conversation is more debate with all having a say until Act 1 ends when airplane crashes into the garden. By the end of the Act 2, with more people having joined the conversation and eight marriage proposals have been offered. But would those marriages be successful or merely misalliances? We’ll never know. But who cares because besides listening to Shaw’s witty, funny and insightful dialogue brimming with modern notions — very new a 100 years ago — we are thoroughly entertained by this production directed by Stephen Brown-Fried. 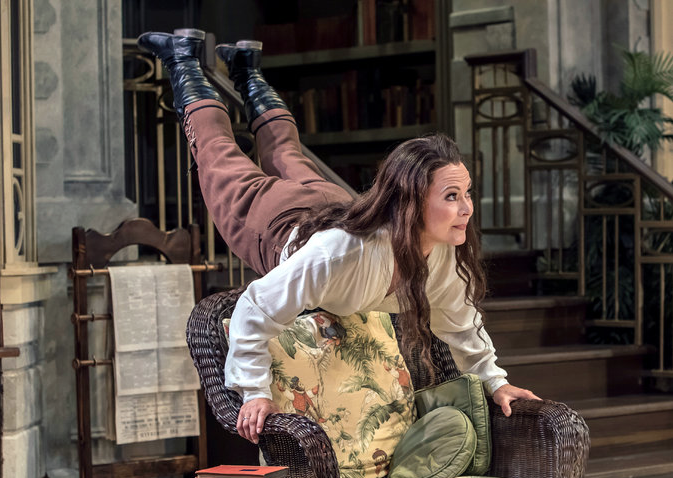 Brian Clinnnin’s conservatory set design is so inviting, especially as it is lit by Andew Hungerford, and the actors’ costumes by Tilly Grimes add much to this country weekend that also include a young socialist (Matt Kleckner) who arrives to kill the wealthy Tarleton. There’s never a dull moment in this sparkling production. England is transitioning from the Victorian to Edwardian Era while all of Europe is under stress as it lumbers into the 20th century, and that includes the Tarleton family whose daughter Hypatia (Katie Fabel), a commoner with oodles of money, is engaged to marry the childish and undersized Bentley Summerhays (Matthew Sherbach), son of Lord Summerhays (Jonathan Gillard Daly). Sounds something like American feminism of the 1960s. And through Shaw, it’s funny and serious at the same time. Hypatia is practical about an engagement not based on love. She probably inherits that from her mother Mrs. Tarleton (Erika Rolfsrud) the most practical of all of the characters, the sort of wife/mother/hostess who tells people it’s time to stop talking or leave the room. Her husband, John Tarleton (Ames Adamson), is quite her match for he is outspoken and hard to shut down. The afternoon-long debate is interrupted when a small aircraft crashes outside the conservatory introducing the handsome pilot (is there any other kind in a play?) Joey Percival (Robbie Simpson), who catches Hypatia’s interest and his passenger Lina Szczepanowska (Caralyn Kozlowski), an attractive circus acrobat who constantly stretches and works her muscles. She is even more direct than Hypatia in her opinions and could probably take any man in the room, which seems to inflame their interest even more, including the Tarleton’s son Johnny (Brian Cade).